• Simon’s MS in Finance program is ranked No. 5 in the U.S. for pre-experience by the Financial Times (2018). Supported by a proven curriculum and complemented by the school’s publication of three preeminent journals—the Journal of Financial Economics, the Journal of Accounting and Economics, and the Journal of Monetary Economics—in our finance program you’ll do more with numbers than crunch them. • The program is STEM-designated, which shows recruiters that you’ll arrive on the job with analytic tools and leadership skills that positively impact a company’s bottom line. In addition, the designation allows international students to work in the U.S. for up to 36 months on a student visa, if hired in a STEM-eligible role. • Get hands-on learning experience by participating in the Meliora Fund, which is managed by a team of Simon MBA and MS students and members of the Simon Finance and Investment Club. The fund is invested in various sectors, including health care, financial, industrial, energy, consumer, and technology, media, and telecom (TMT). Learn more about our MS in Finance program details. There are currently 186 students in the MS in Finance program that are, on average, 22-years old. About 55 percent of the class is comprised of female students, with 45 percent male students. The GMAT range (80th percentile) is between 640–740, and the GPA range (80th percentile) is between 3.0–3.8. Students in the program have an average of seven months of previous work experience. 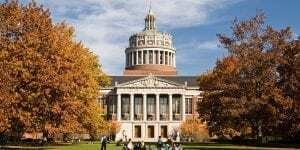 Tuition for the University of Rochester MS in Finance is currently $78,000. More than 50 percent of MS in Marketing Analytics students receive scholarship support.